Description: Many botanists place the hornbeams in the birch family Betulaceae, though some group them with the hazels (Corylus) and hop-hornbeams (Ostrya) in a segregate family, Corylaceae. The tree can reach a height of 70 feet. The bark is silver-grey . The female and male blossoms have different shapes but are found on the same tree. The leaves are deciduous, alternate, and simple with a serrated margin, and typically vary from 1-3 inches in length. The flowers are wind-pollinated pendulous catkins, produced from April through May. 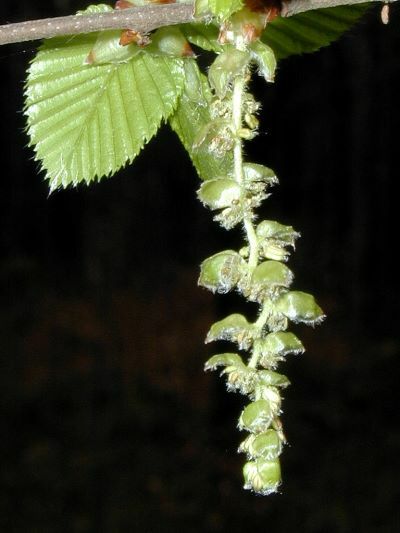 The male and female flowers are on separate catkins, but on the same tree (monoecious). Monday morning feeling, one feels to be too weak to cope with the daily duties. Overtaxing in the daily routine.